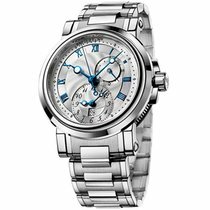 For sale is a near mint condition 42mm stainless steel Breguet Marine II Dual Time GMT. The 5857ST/12/SZO comes with box and papers was originally purchased in 2016. 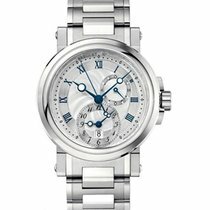 The Breguet features a polished steel case with a fixed polished steel smooth bezel. The Marine is mounted on a steel bracelet with polished/brushed accents and features a hidden push button butterfly clasp. The bracelet contains 15 full size links and will comfortably fit a 7.5 inch wrist. The Dual Time features a silver guilloche dial with applied blued Roman numeral hour markers, blued superluminova coated hands, sub dials for the dual time / gmt function at 6 and 3 o’clock, as well as a date window aperture at 6 o’clock. The movement used in the 5857ST12SZO is the Breguet calibre 517F which features 65 hours of power reserve, and is keeping time as it should. Overall the Breguet is in near mint condition with the only noticeable imperfection being some hairline scratches on bracelet which are barely visible to the naked eye.